Get set for The List Love to make your mouth water, as we are providing a top 10 list of the 10 biggest burgers in the world. So, if you have a big appetite and a love for meat and bread, you will most definitely want to head to the following restaurants. The Challenge: The 8th Wonder burger, also known as the Mt. 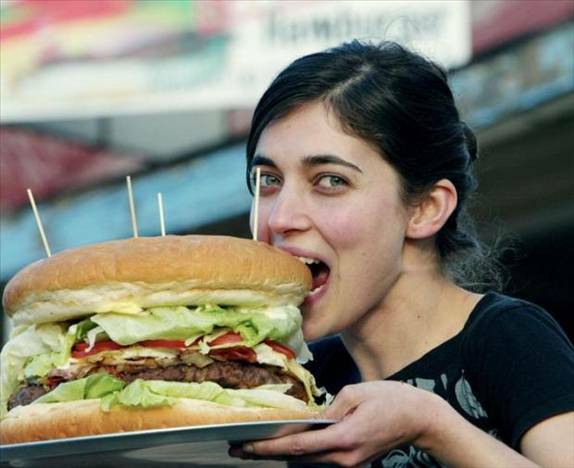 Olympus Burger, is the largest burger in the world, and is an incredible 11.5 inches tall and 28 inches in diameter. 10 people have just 60 minutes to consume this epic beast at Clinton Station Diner. The Prize: Successful teams will receive $5,000, but it’s highly unlikely you’ll win as no-one ever has! 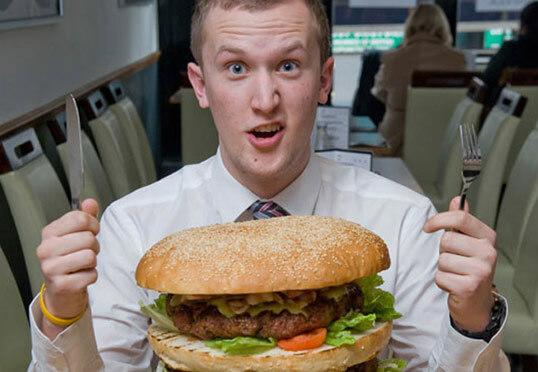 The Challenge: Can you tackle Britain’s biggest burger? 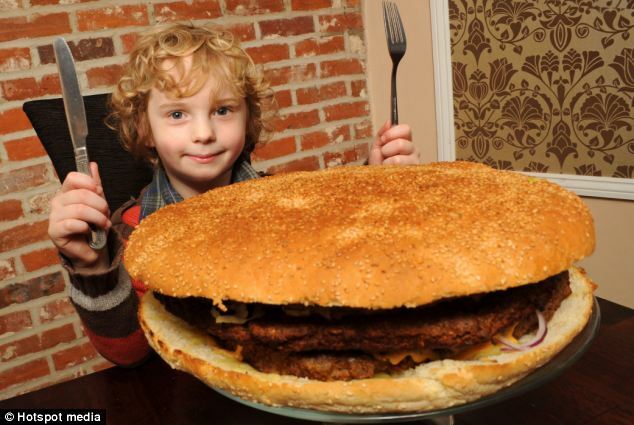 It’s 30cm in diameter and includes 26 quarter pounders, 40 slices of cheese and a very large bun. It has nearly a week’s calorific intake for the average man at 13,464 calories! The Prize: The burger, which is usually costs £30, will be free to anyone who finishes the burger. You’ll also receive £200 in cash. The Challenge: Hailed as the hottest burger on the planet by Man V. Food, the 4 Horseman challenge that’s aimed at those with a big appetite and a love of spicy foods. You will have just 25 minutes to devour this burger, which includes ghost peppers, habanera sauce, jalapeno and fresh Serrano. There’s also a “chuck bucket” for anyone who can’t handle the hot burger – and if you “chuck” and miss the bucket, a $20 fee will be added to your bill. You are allowed to try the challenge as long as you are 18 years of age or older or have a parent or guardian who can sign the “4 Horsemen Liability Waiver”. The Prize: A free burger and your photo on the wall of fame. The Challenge: One person has to eat seven six-ounce burger patties, seven slices of cheese, 14 slices of bacon and two giant portions of double-fried fries in just 20 minutes. The Prize: A free meal, a full stomach and a t-shirt. The Challenge: Can you slay The Beast? If you feel you’re up to the job of eating a 14lb burger, you should definitely enter the competition. 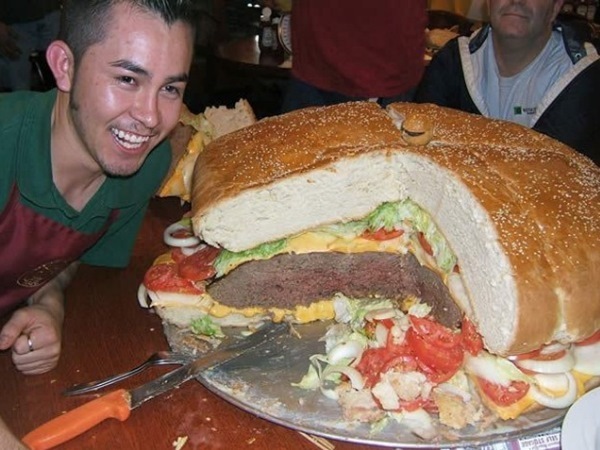 This burger is so big that it’s even sliced up like a cake so you can make your way through it with “ease”. The burger, which is made up of 7lb Black Angus beef, half lb of mature cheddar, 7 streaky bacon, 1 whole lettuce, 7 whole tomatoes and 1lb skinny fries, also comes with a milkshake and two scoops of dairy ice cream. Good luck! 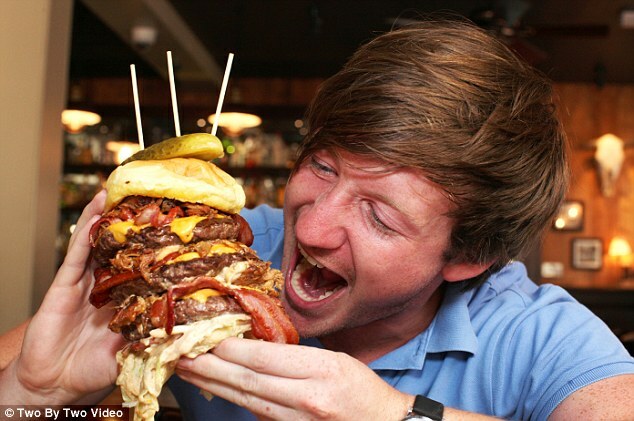 You can also take on the Cheats Challenge – which means up to 4 people can try to make their way through a burger. The Prize: If you eat the burger you won’t have to pay a penny, and you’ll also receive a free t-shirt that reads ‘I Devoured the Beast’. If you fail, you will have to cough up £60. If you fail the Cheats Challenge, you’ll pay £90. The Challenge: Australia’s Biggest Hamburger Challenge is so tough that you can even have some help off a friend. You and one other person will have to work your way through three three-pound burger patties, 20 slices of bacon, 8 eggs, cheese, tomatoes, onions, pickles, lettuce and a three-pound bun in just one hour. The Prize: A free burger. The Challenge: Could you handle the Bull Burger? 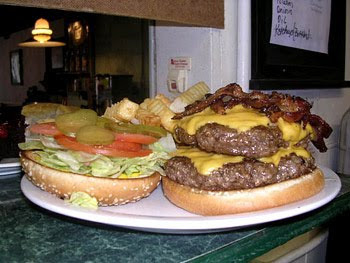 It might be a struggle as it offers 2 1/2 pounds of hamburger, as well as four slices of cheese, four slices of bacon, tomatoes, lettuce, french fries, onions, pickles, mayonnaise and mustard. It all has to be consumed within 30 minutes of your lose! The Prize: A free burger, t-shirt and your photo on the Bull Board. 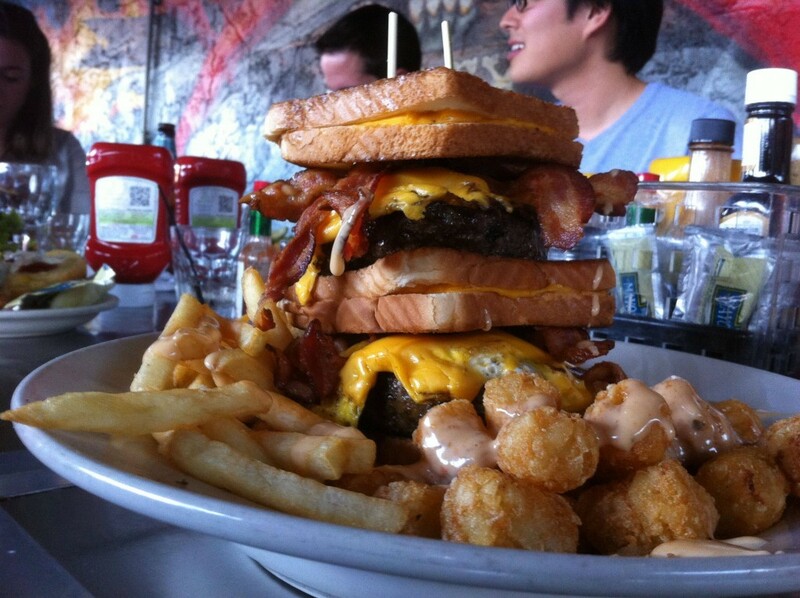 The Challenge: The Triple Coronary Bypass Burger Challenge is not for the faint hearted, as it comes with three burger patties, 14 slices of American cheese, 10 bacon rashes and three fried eggs, as well as two grilled cheese sandwiches! 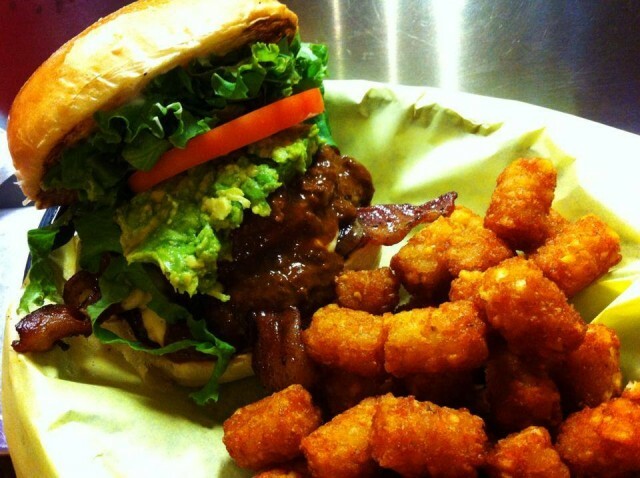 The Challenge: The Kookamonga Burger is a shocking 12,387 calories – which would take 26 hours of aerobics to burn off! Made up of 4 pounds of ground chuck, a 2 pound bun, 1 1/2 pounds of tomato, pickles, lettuce, cheese and onion and the option of fries, you will have just 60 minutes to gnaw away at this crazy burger. The Prize: A free burger and a photo in their Hall of Fame. Should you fail, you’ll end up in the Hall of Shame! 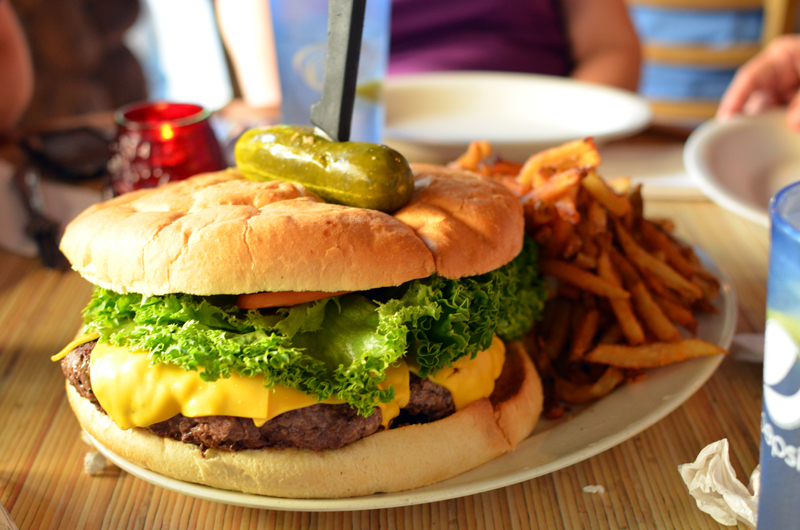 The Challenge: The Big Al Burger isn’t an official challenge, but eating all of it is bound to be challenging. 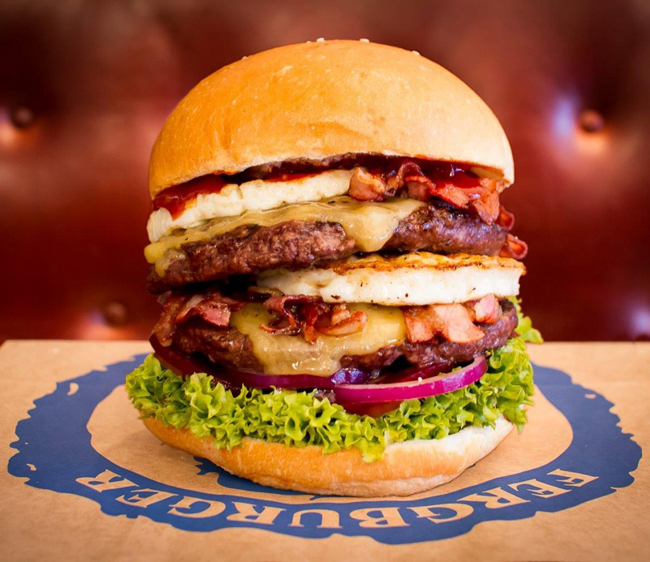 This double-decker burger offers a pound of beef, round bacon, cheese, two fried eggs, sliced beet, tomato, red onion, lettuce, relish and aioli, all squeezed into a rather big bun. The Prize: No prize as it isn’t an official challenge, and so it will set you back $17.50 NZD. Want to know more about some of the biggest foods on the planet? Click here. Have you tried any of the burgers mentioned above? Know a bigger one? Drop us a comment below. 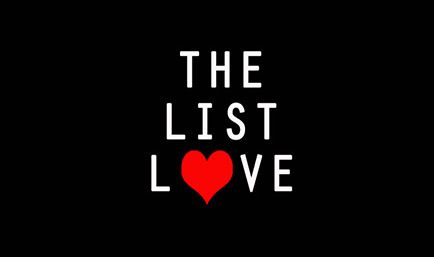 Don’t forget to follow The List Love on Facebook, Twitter and Google+.